Cassini's Zips Past the Death Star - Solar System Planets And Moons Section. Cassini's Zips Past the Death Star. /JPL/SSI Aug 4, 2005. 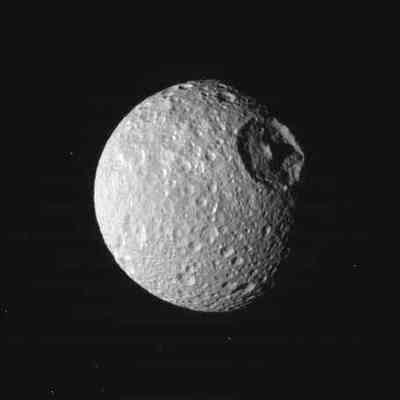 The great eye of Mimas. Image credit: NASA/JPL/SSI. NASA's Cassini spacecraft made a relatively close flyby of Saturn's Moon Mimas on August 2nd, 2005. The 130 km (80 mile) crater Herschel makes the Moon look amazingly similar to the Death star from the star Wars series of movies. Cassini passed only 62,700 km (38,800 miles) above Mimas; the closest it's ever been to the moon. The great eye of Saturn's Moon Mimas (MY-muss), a 130-kilometer-wide (80-mile) impact crater called Herschel, stares out from the battered Moon in this raw image taken by the Cassini spacecraft during a flyby on Aug. 2. The Herschel crater is the moon's most prominent feature, and the impact that formed it probably nearly destroyed Mimas. Cassini flew by Mimas at 62,700 kilometers (38,800 miles) above the moons surface, bringing it closer to the little Moon than ever before.